If you’re a cocktail-lover, a good home barware set is absolutely essential. Learning to make the basics yourself will save you a ton of money, and it’s much easier than you think. The best cocktail shaker is arguably the most foundational piece of any home bar, since it’s difficult to improvise most cocktails without one. There are two main types of cocktail shakers: the Boston and cobbler styles. Boston shakers are iconic and classic, most frequently used by professional bartenders. They’re comprised of a large cup and a small cup, usually made of metal, which fit together for a firm seal. Cobbler-style shakers are more often used by home bartenders, since they have a strainer included and are easier to use. They’re made up of a main canister, a lid with a strainer, and a cap. Deciding which type of cocktail shaker to get is only the beginning. You also want to make sure the cocktail shaker is worth its salt. Some factors to consider include the material, weight, size, and balance. Additionally, it’s important to find a shaker that has a good solid seal, so your drinks won’t leak while you shake. However, it should also be easy to open and pour them when you’re ready. Based on those criteria, here are a few of the best cocktail shakers. This cocktail shaker set is great for beginners. It’s a cobbler style shaker, so it comes with a strainer included, and this particular set comes with a jigger as well. It’s simple but does the job well. This shaker is made from stainless steel. It has a 24 ounce capacity, and the jigger includes 1 ounce and 1/2 ounce measurements. Many cobbler shakers have issues with leaking, since they don’t create as tight of a seal as Boston shakers. Some users reported that issue with this one, but most have found that it creates a reasonably tight seal. It’s always easy to separate the pieces when you’re ready to pour. This shaker is a good value for novices. This is a simple Boston cocktail shaker. 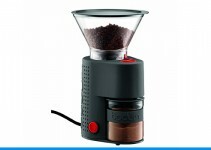 It’s made from weighted stainless steel, which helps to maintain balance even while the shaker is empty. At 28 ounces, it’s enough to make two cocktails at once. The set creates a wonderfully tight seal, and it’s easy to break the seal when you need to. This cocktail shaker is sturdy and well-designed. It’s ideal for professional bartenders, with its high volume and weighted design. The downside to the weight caps is that it can be more tiring to shake a ton of cocktails with this shaker, but drink mixers love the sturdiness. Most cocktail shakers are made from simple stainless steel or glass, which means your hands can get pretty cold after shaking ice-cold cocktails in it for a while. The OXO insulated shaker solves that problem: these two pieces are fully insulated. It’s made of stainless steel with some plastic components. This cocktail shaker is neither a Boston nor a cobbler style. Instead, it’s made of two pieces that screw onto each other for a leak-proof seal that’s totally idiot-proof. For amateur home bartenders who are looking to make simple drinks, this shaker is truly ideal. However, it’s probably not worth it for more advanced drink mixers who like to use muddled herbs or fruits in cocktails. The main reason is that the strainer is too fine for those thick ingredients; they’ll get stuck or take forever to make it through. This Boston shaker from Winco is about as simple as it gets: it comes with one 30 ounce metal tin. It can be used with a pint glass as the second piece, which is how many professionals like to mix their cocktails. You can also buy a second tin separately to use as a top piece. 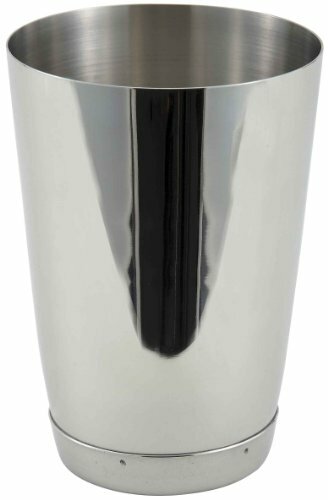 This cocktail shaker is well-rated because it’s made from high-quality stainless steel and is perfect for home or professional use. 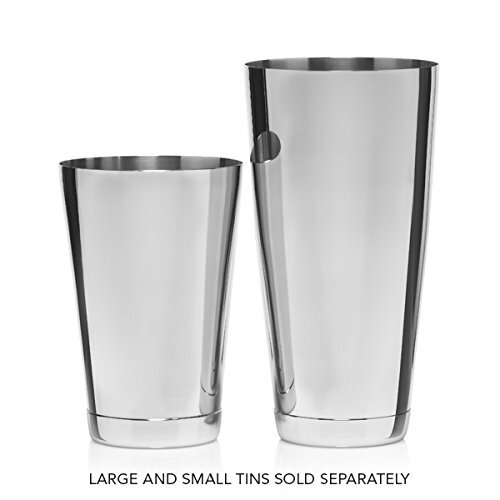 At 30 ounces it has a larger capacity than most other cocktail shakers. It has a nice weight to it that makes it easy to handle despite the larger size. Of course, this set is not ideal for those who want an all-in-one solution, but it’s great for a one-piece set. When used with a pint glass, it creates an excellent seal that’s easy to break when necessary. 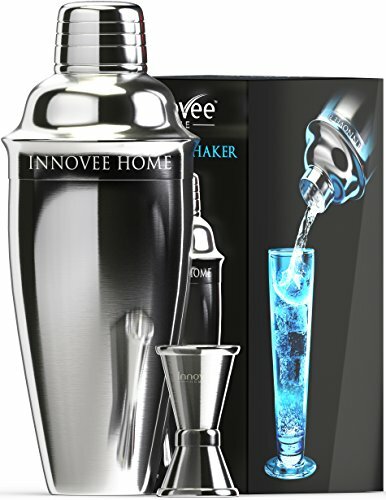 The Innovee cocktail shaker set comes with a shaker, built-in strainer, jigger and recipe book. 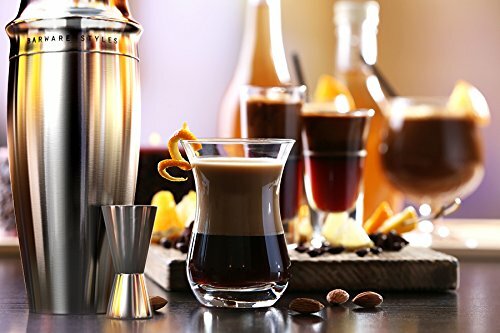 It’s ideal for amateur home bartenders and drink mixers, since it’s affordable, easy to use and comes with the most basic components of a bar set. 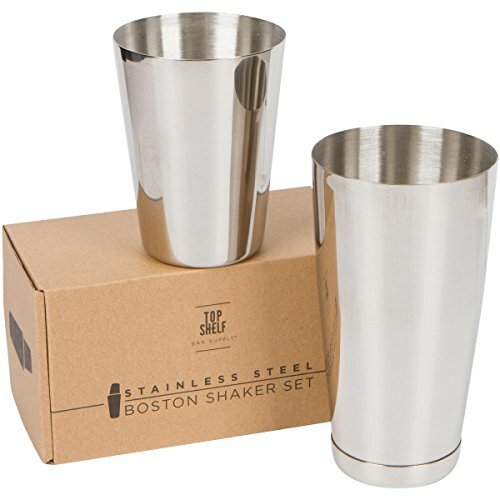 The cocktail shaker in this set is made from stainless steel and is cobbler-style. However, users say it’s sometimes difficult to get the shaker to separate after you achieve the initial seal. On the other hand, it sometimes leaks when you shake vigorously. This is a downside of many cobbler-style shakers — it’s much more difficult to achieve a tight seal with this design. We recommend this as a beginner set for those who want to see if home bartending is something they’ll want to invest more money in down the line. 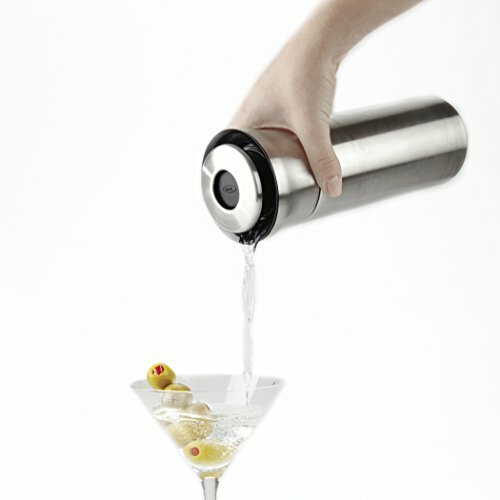 Cocktail Kingdom is well-known in the bartending community for setting the standard for quality bar equipment. 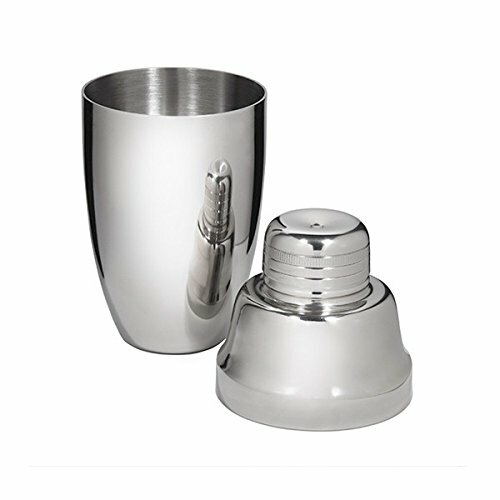 This one is perfect for home bartenders who want the easier-to-use style of cocktail shaker, the cobbler style. 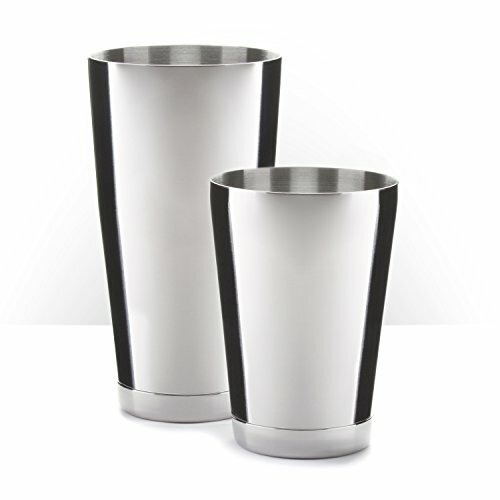 This shaker is made from 18/8 stainless steel, and it makes one drink at a time with a capacity of 18 ounces. This shaker is very heavy and solid. It feels sturdy in the hands, and stays balanced on countertops even while empty. It creates a tough seal that’s easy to break when you’re done shaking. 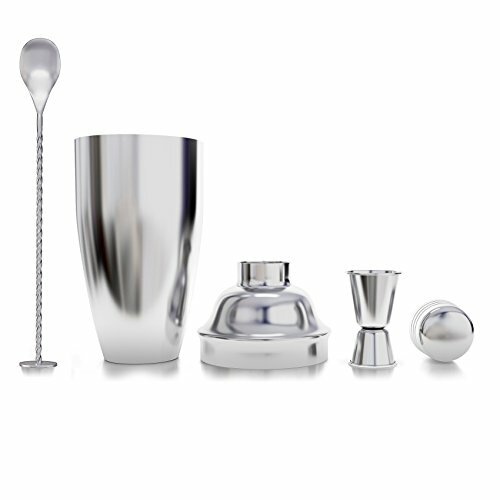 This classic cocktail shaker, the Koriko set, consists of two pieces that must be bought separately. Together, they form a Boston shaker. They fit together to form a leak-proof seal. This shaker is 28 ounces, enough to make two full cocktails at once. 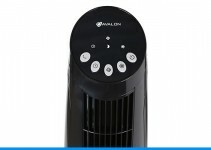 This is the size recommended by professionals, though it may be unnecessary for casual home use. This set is made with 18/8 stainless steel. The two pieces fit together well, and come apart easily. This set is perfect for those who are looking to upgrade from a novice set. The cocktail set from Barware Styles is a bargain if we’ve ever seen one. It’s low-priced and includes two of the main items you need in any home bar set: a cobbler-style shaker and a jigger for measuring ingredients. It’s a 24 ounce shaker made from high-quality stainless steel. It’s very easy to get a tight seal. It does tend to get cold when shaking drinks, since it’s not insulated. The jigger also isn’t ideal, since it doesn’t include lines for measurement. Still, this is a great cocktail shaker. This simple cocktail shaker is aimed toward professional bartenders. As a classic Boston shaker, it consists of two stainless steel tins. This one is made of food-grade stainless steel. This shaker has an excellent seal; it’s highly unlikely to leak. It’s easy to get the two pieces to fit together properly, and it’s easy to unseal them when you’re done. It’s sturdy and easy to clean. It’s only an 18 ounce shaker, so you can make one cocktail at a time. The other con of this shaker is true for all Boston shakers, and that’s the fact that it doesn’t come with a strainer. Buy one separately and you’ll have the perfect set on a low budget. This set is targeted toward beginner home bartenders, including not only a cocktail shaker but also a jigger, mixing spoon and cocktail recipe book. The shaker is cobbler-style, so the strainer is included. That makes it ideal for novices, especially since it’s easier to get a seal with this style of shaker. 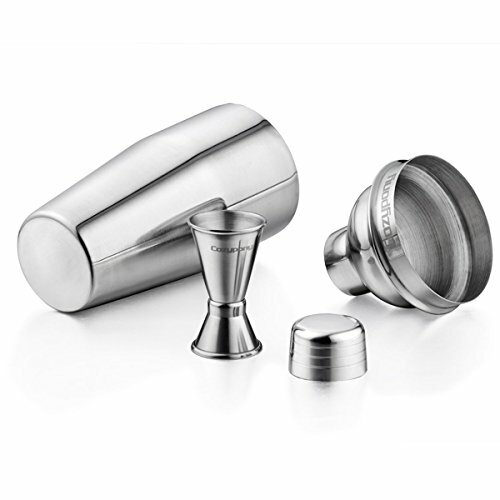 The Cresimo cocktail shaker is made with 18/8 stainless steel. It has a good seal, but some users note that the shaker can get quite cold to the touch and occasionally has trouble with ingredients getting stuck in the mesh strainer. At 24 ounces, it can make just under 2 full cocktails.